We have had the pleasure of working with the most amazing couples, vendors, venues, planners and designers in the wedding industry. We are honored to have been part of their marvelous events. We value each opportunity and so appreciate the lovely praise they have given us. LeAnn and The Vintage Laundry team made our day so special. Her selections were beautifully coordinated, delivery was timely, and she has the fastest reply of any vendor I've worked with for any event. 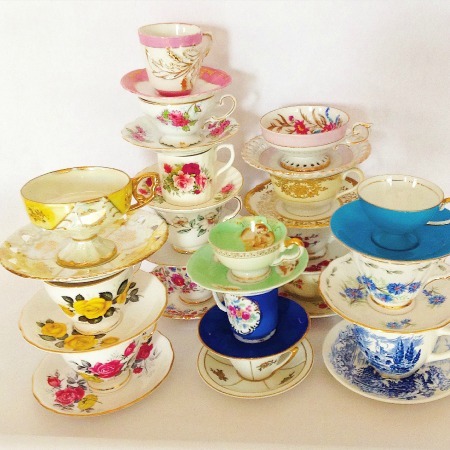 We rented lots of vintage tea cups for a wedding on a rainy day in April and it was a hit! LeAnn was amazing to work with friendly, professional and timely. She was able to provide the most stunning coupes that worked perfectly for our overall event! LeAnn has a beautiful collection. I also own a rental company and I needed some pieces to fill out an event I was working on. LeAnn was so helpful, super responsive and provided me with the most beautiful trays to solidify my vision. I highly recommend working with her.